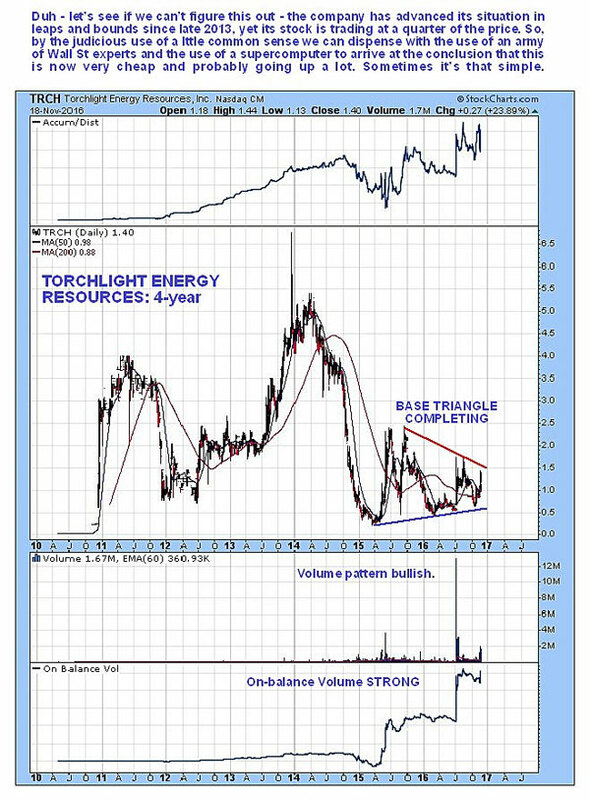 Technical analyst Clive Maund reiterates his investment thesis for Torchlight Energy Resources after the stock spikes. It looks like we got back into Torchlight at an opportune moment some days back, because yesterday it spiked quite dramatically above resistance on good volume as shorts panicked, and now looks good. 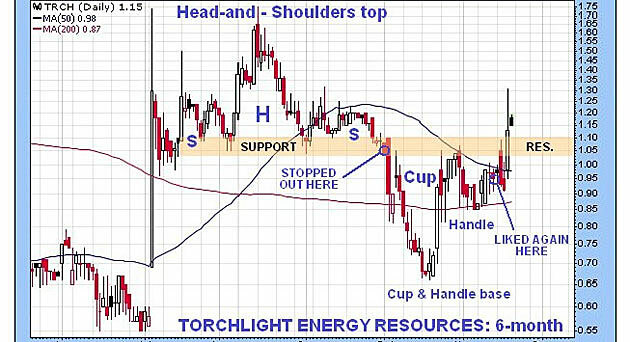 The shorts miscalculated-they thought that because Torchlight had broken down from a head-and-shoulders top, which we incidentally spotted in time and sidestepped, it was done for, and an automatic short on a rally to resistance at the underside of the pattern. The problem was they didn't spot that the pattern in recent days was morphing into a cup-and-handle base, which we did-a subtle difference, but subtle differences in this business can mean the difference between a whacking great profit and a terrible loss. Furthermore, they were playing with fire shorting a company with such excellent fundamentals. The 4-year chart is interesting as it emphasizes just how cheap Torchlight is now compared to the past, especially given its rapidly improving fundamental situation. A big reason for this brief update, in addition to making clear that this successful breakout was a very positive development that opens the door to continued advance, is to point out that a day after the article was posted on the site on Nov. 14, Bob Moriarty of 321gold came out with an update of his own, replete with some exceptionally positive fundamental info about the company's situation (Torchlight Delivers Again and Again). While Moriarty is biased, and admits as much, I have no reason to doubt the veracity of what he says. And anyway, in this business, there is nothing wrong with telling the truth, because most investors are too dumb to believe that this will go much higher, and will only believe it when they see it, which is good because it means that we can buy it much cheaper ahead of them. So we stay long, and fresh purchases are in order on any weakness. 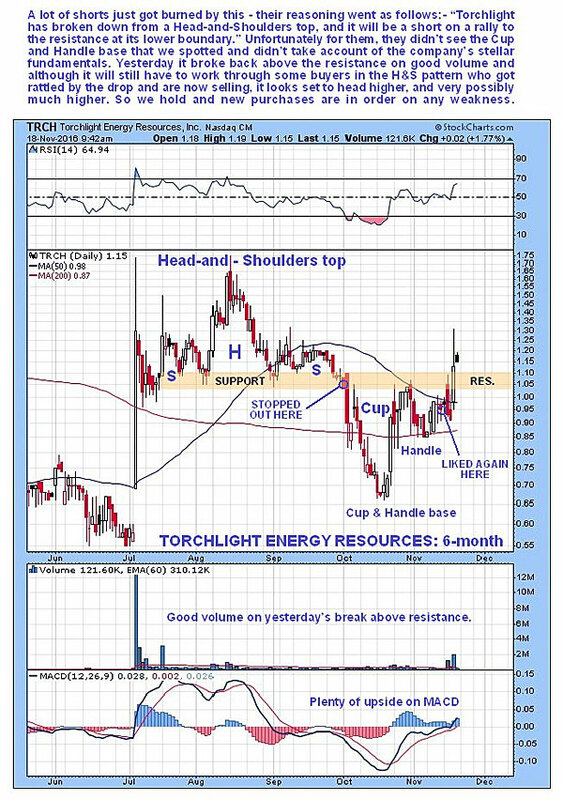 Torchlight Energy Resources Inc. (TRCH:NASDAQ) closed at $1.13 on Nov. 17, 2016. Clive Maund is an English technical analyst, holding a diploma from the Society of Technical Analysts, Cambridge and lives in The Lake District, Chile. Copyright © 2003-2012 CliveMaund. All Rights Reserved.